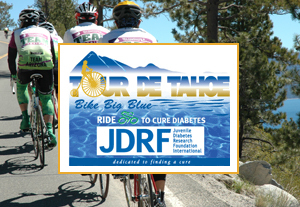 Tour de Tahoe – Bike Big Blue – The Ride to Cure Diabetes will be taking place Sunday, September 8, 2013! Experience the adventure of a lifetime as you ride your bike around Lake Tahoe’s 72-mile shoreline! Hosted by Bike the West and the Reno Tahoe Territory of the Nevada Commission on Tourism, Tour de Tahoe is considered America’s most beautiful bike ride and has the reputation of being one of the best rides in the country. The course is beautiful and challenging, with an 800-foot climb to an Emerald Bay overlook and rest stop, and a 1,000-foot climb to Spooner Junction, plus many shorter ascents and descents, all contributing to more than 4,000 vertical feet of elevation gain. But don’t worry, there will be plenty of rest stops along the way with food and beverages and gorgeous views. Only conditioned recreational bicyclists who are experienced in riding roadways are recommended to participate. For the rest of us there is the Boat Cruise & 35-mile Lake Tahoe Half Ride Fun Tour, a more relaxing sightseeing/bicycling event. It includes a ride and continental breakfast on the Tahoe Queen Paddle Wheeler, rests stops, lunch, and more. Friends and family can even sign up for the Fun Boat Cruise and just ride the boat across the lake and back. There is also an After Ride Pool Party with great food, live entertainment, and swimming at the Horizon Casino Resort. Tour de Tahoe is so popular that tickets sell out quickly every year, so reserve your spot today. The ride starts and finishes at the Lake Tahoe Horizon Casino Resort. All proceeds go to support the Juvenile Diabetes Research Foundation.